Today the Swedish Exhibition & Congress Centre presents the third phase of its expansion plans up until 2030. The planned expansion includes larger entrances, flexible meeting and event facilities and increased hotel capacity. In this third phase, focus will be placed on building a larger main entrance with a terrace and a hotel and office complex beside Korsvägen, a central hub in the events district of Gothenburg. The plans are ready and construction of the new entrances will start in 2017. 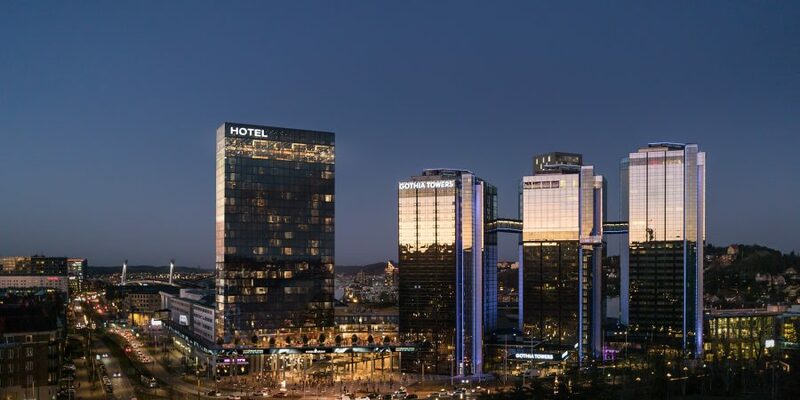 “In the past two years we have achieved organic growth of 35 percent and increased our number of visits by 30 percent,” says Carin Kindbom, President and CEO of the Swedish Exhibition & Congress Centre, of which Gothia Towers is a part. “We need to speed up our expansion to maximise our potential to grow internationally and attract more visitors to Gothenburg. Our vision is to create Europe’s most attractive venue by offering the best overall experience. Because of the market’s demands and the opening of Västlänken station next to Korsvägen, we are prioritising the construction of new, larger entrances. Construction will start in 2017. “Upgrading our entrances will enable us to increase our visitor capacity, so that we can carry out a greater number and variety of events simultaneously. The enlarged main entrance onto Korsvägen will give us the space necessary to receive larger groups of visitors. The final phase of our expansion is now in place, including larger entrances, flexible meeting and event facilities and increased hotel capacity. We have now clarified our goals and plans up until 2030,” says Carin. The new hotel and office building next to Korsvägen, a central hub in the events district of Gothenburg, is expected to have over 30 storeys. The Swedish Exhibition & Congress Centre is a financially independent foundation with no owners or investors. All investment and funding is done on the Foundation’s merits and all the surplus is reinvested in the business. “The Foundation’s mission is to promote industry in West Sweden, and as these investments are gradually implemented, we will see increasingly strong spin-off effects on local tourism. This will benefit the whole city and local region,” says Roger Holtback, the Foundation’s Chairman of the Board. The Swedish Exhibition & Congress Centre’s plans were presented in a manifesto in 2015. The investment plan up until 2030 is estimated to cost SEK 4-5 billion. “Gothenburg is an exciting and fast-growing city, and this growth trend will continue for many years given the historic construction boom that is just beginning. With our expansion plans, we aim to contribute to Gothenburg’s development as an internationally attractive destination. Our ambitious plans testify to our strong belief in the future. However, they may need adjusting along the way, depending on how the situation develops,” says Roger. Today, the Swedish Exhibition & Congress Centre submitted its application to the City of Gothenburg for a development permit to construct an expanded main entrance and a hotel and office complex next to Korsvägen.